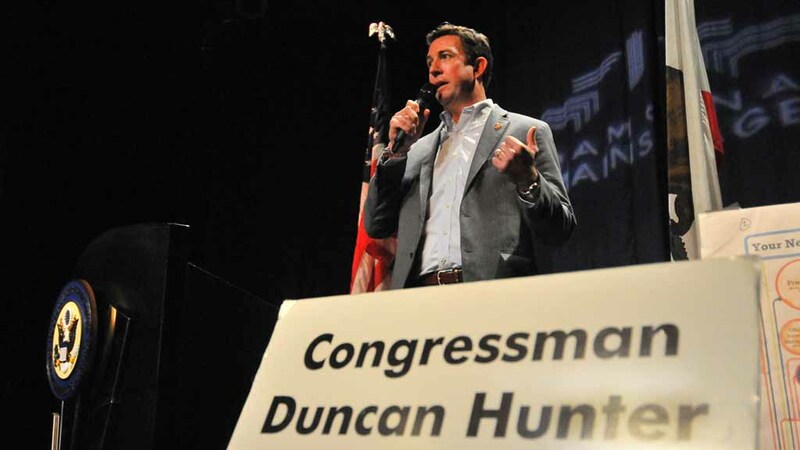 A federal investigation into the financial practices of Rep. Duncan D. Hunter ranges from alleged campaign finance irregularities to bank fraud, according to a search warrant that was made public Wednesday. The document discovered and disseminated via Twitter by Seamus Hughes, deputy director of the Program on Extremism at George Washington University, showed that investigators seized computer equipment, bills and disbursements and other documents in a March raid on the Alexandria, Virginia, home of Hunter’s campaign treasurer, Chris Marston. Neither Hunter’s office not an attorney for Marston immediately responded to a request for comment. Hunter, a former Marine and Republican who followed his father into office in the seat that represents parts of eastern San Diego County, has faced scrutiny for his campaign’s financial dealings since early last year. He has since reimbursed his campaign around $62,000 for expenses like a family vacation in Italy, dental surgery and purchases in the Disneyland gift shop. The search warrant, approved by U.S. Magistrate Judge Michael Nachmanoff on Feb. 22, called for the seizure of records of campaign fund disbursements, financial disclosures, responses to inquiries by the Federal Elections Commission, calendars and travel records, financial records, and tax and accounting records. The investigators also sought communications between the congressman, his wife, Marston and partner Brenda Hankins and other staffers. According to the search warrant, the investigators were looking for documents that showed evidence of alleged “prohibited conversion of any Hunter committee campaign contributions or donations for personal use from February 2010 to the present”; “a scheme to defraud First National Bank by making false statements related to video game charges which resulted in the refunding or crediting of charges not properly due”; falsification of FEC reports; and a conspiracy to commit the crimes. Hunter told The San Diego Union-Tribune in April of last year that the $1,300 in video game charges were the result of a credit card mix-up by his teenage son. He called the charges fraudulent, and said they were reversed and credited back to the campaign credit card, the newspaper reported.